Kim Jong-un has been elected to North Korea’s rubber-stamp parliament with a unanimous vote from his district, state media say. Kim Jong-un’s 100% approval from his Mount Paektu constituency reflects the “absolute support” of people in the country, KCNA news agency says. 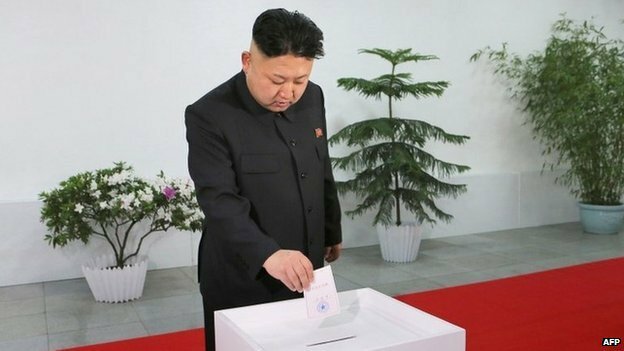 It was the first time such a poll had been held since Kim Jong-un assumed power. He became leader of North Korea following the death of his father, Kim Jong-il, in 2011. Kim Jong-un holds many titles, including Supreme Commander of the armed forces. The democratic duty for voters in these elections is not so much deciding who they want to represent them, but whether they agree with the ruling party’s choice. In the election held in 2009, turnout was 99%, with 100% of votes in favor of the named candidates. Meanwhile, state media on Sunday identified a woman accompanying Kim Jong-un to a polling station. Kim Yo-jong, who state media described as a “senior official”, is thought to be the younger sister of Kim Jong-un. Various reports say she may be 26 or 27 years old. Kim Yo-jong was seen on state television riding a horse in 2012, and beside Kim Jong-un as they attended Kim Jong-il’s funeral in 2011, AFP news agency says.